Our office product solutions will help your organization stay focused and efficient. WM Imaging Solutions offers digital copy products ranging in size from tabletop needs to larger, higher speed solutions for workgroups and larger offices. Whatever size you need, the solution is available from WM Imaging, and in each case, higher productivity, reasonable costs, dependable equipment, and responsive, expert service is delivered. 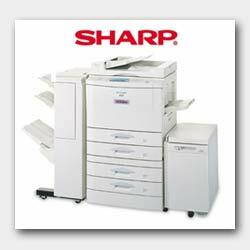 It is no accident that our office is in the same building as the US's largest independent distributor of Sharp office products. Our company goal is fast delivery of equipment, parts, and service. Availability of parts is crucial to responsive service. Unlike others in the business of providng equipment, we do not have to wait for overnight shipment of parts, toner, or other supplies to fix a problem. While many vendors assign service technicians based on a certain number of machines, WM Imaging Solutions assigns a service territory around the capability of delivering fast, 4 hour maximum response time service to our customers. Downtime is expensive to your objectives; it is also expensive to ours. All our technicians are factory trained. We do not use our customers for a training ground like some. You benefit from prompt, expert service. Let us evaluate your paperwork processes so that we can provide you with a profitable solution, one that delivers what you really need to fulfill the goals of your company with the lowest possible costs. For especially attractive solutions for your office, take advantage of our unique position in offering off-lease digital copiers as an alternative to the cost of brand new equipment. Off-lease copiers are returned to the leasing agents after having been fully serviced for their installation time, very often having been returned because of business consolidations and bankruptcies with very little use. Our off-lease copiers operate as new: the same warranty, same service costs - BUT - most often half the price of new installed copiers. Another way to save with WM Imaging.